Thailand is indeed known as the Land of Smiles. Rightly so because it has among the world’s best attractions, the best people and the well-respected and well-loved monarch. However, these are not all as there are a lot of other interesting facts about Thailand. Are you after the size? Yes, it is true that Thailand is not among the largest of countries in terms of land area and population but it does have some of the world’s largest such as the largest golden Buddha. 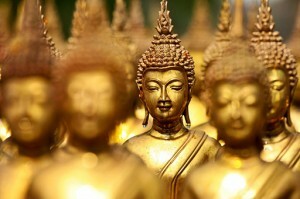 The Wat Traimit is the temple that houses the golden Buddha which is more than 15 feet tall. It is made up of 18 karat gold and surely be very expensive. However, not everyone knew then of its existence because it was covered in plaster not until around 1955 when it was transferred from its previous site to another site. The rope hosting the image snapped causing for it fall and its plaster cover cracked, exposing the massive golden Buddha underneath. Currently, it is year 2557 in Thailand and 2014 in majority of the countries around the world. Confusing? It is really for those who are date-conscious. Thailand utilizes the Buddhist form in writing the year thus 2557 for year 2014. Thailand is a constitutional monarchy state and its King, King Bhumibol Adulyadej (Rama IX), is at present the world’s longest serving monarch having been in the position since June 9, 1946 but he was only crowned as King in May 5, 1950. A well-loved monarch, the King is the symbol of national unity in Thailand. No, not all conjoined twins started in the Kingdom but the alternative name for conjoined twins was somehow related to the old name of Thailand. Prior to 1939, Thailand is still known as Siam and several decades before that year, conjoined twins Chang and Eng were born in the Kingdom. During their teenage years, they were brought to the United States by Captain Abel Coffin where they were shown in public exhibition. They were labeled as “The Siamese Double Boys”2 and the alternative name for conjoined twins is still being used today. Hello, I am learning about Thailand, as I live in Canada and have Thai friends and of course love Thai food. But I am learning some very sad facts about the street dogs there. I am helping a young woman in Thailand with funds etc, and wondering why dogs are treated so badly?